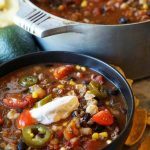 This is an Easy Taco Soup Recipe; a little spicy and delicious, this soup that’s made with pantry staples! If you can open a can – you can make this fabulous soup! This is the BEST soup to make on Sunday and enjoy during the week! This post has been updated from May 2016 to improve the reader experience. 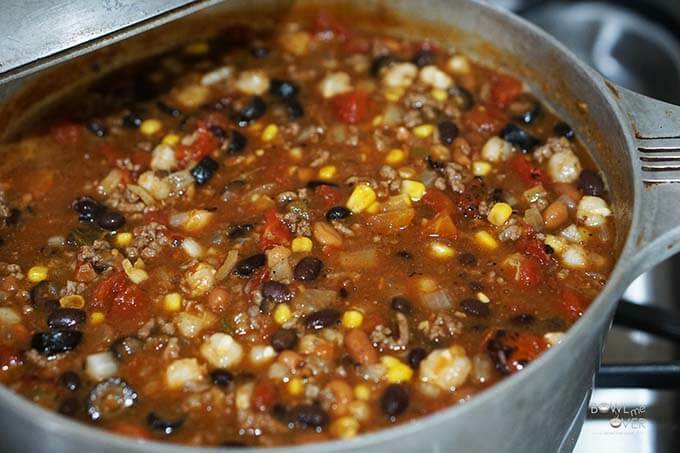 This is a recipe everyone must have handy, because if you can brown ground beef and use your can opener …..you can make this soup! 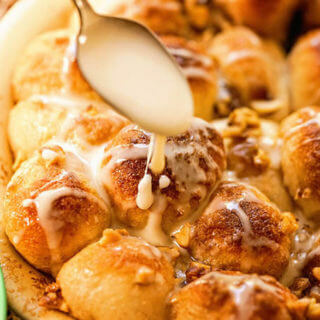 I love this recipe because it is truly that easy and that good! I love a simple soup with a whole lot of flavor. Soups like Authentic Posole and my Green Chili Chicken Posole Recipe come right to mind! 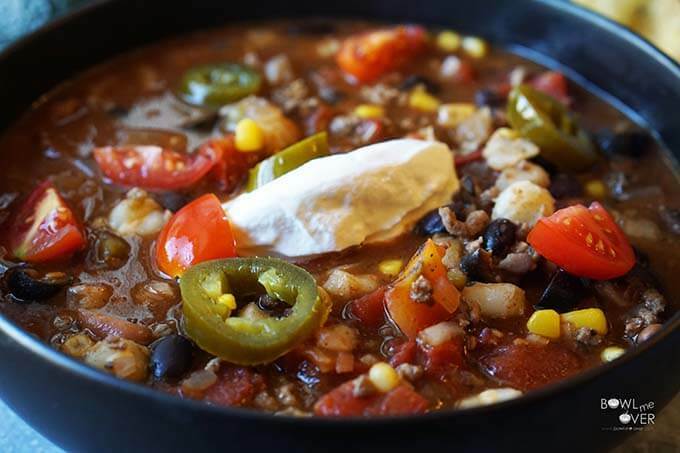 This taco soup recipe is that good too! This is my Mom’s recipe, and she’s been making it for years. 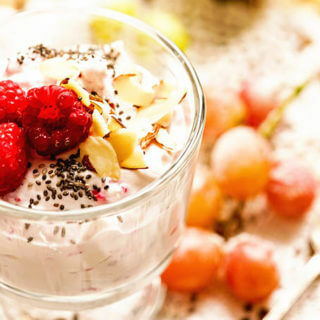 It’s a recipe I make probably once a month because it’s easy, good and pretty good for you! That’s the trifecta in my opinion! It freezes great and tastes even better on day two! I’ve tweaked it a bit by adding diced onions and hominy, but you can sub green beans if you’re not a fan of hominy. You’ll start by browning the ground beef and adding the remaining ingredients. Black Beans, kidney beans and pinto beans would be my first choice, however, if all I had in the pantry was cannellini beans, I’d use those! 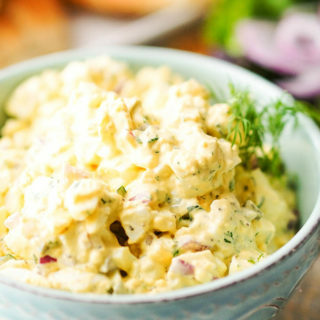 This is a great pantry staple meal! Garnish with diced tomatoes and sour cream – an extra slice or two or jalapenos will spice up your meal! Can you make Taco Soup in the Crock Pot? Absolutely! Just brown the meat first. Then add all of the ingredients to the slow cooker. Stir to combine, add the lid and set the temperature to low and simmer for eight hours. This soup tastes even better on day two – it’s a great meal! Add the chopped onion and taco seasoning packet and saute. Open the cans – DO NOT drain. Add all of the remaining ingredients in with the taco meat and onions. Increase the heat to high and bring to a boil, stir well. Reduce heat to low, stirring occasionally. Simmer for an hour – serve and enjoy! But seriously, this soup can stand on its own without any garnish – it’s just delicious! Leftover soup? No problem – here’s what you make on day two! Don’t forget this soup freezes great, so freeze a quart for later. Then on day two…. Easy Nachos! Just drain the excess liquid and top your favorite chips, add some cheese and toss it into the oven to get the cheese all melty. Top off a baked potato. More delicious easy soup recipes to enjoy! Ladle – this one is on my wishlist because it’s so whimsical! Plus it comes in a variety of colors and makes eating a great soup that much more fun! Snap a picture of this tasty soup and be sure to tag me at #bowlmeover or on Instagram with @bowl_me_over or #bowlmeover. You know what I always say… Soup is good food! Ooh! Also, when you have a quick moment, be sure and comment below with a five star rating. 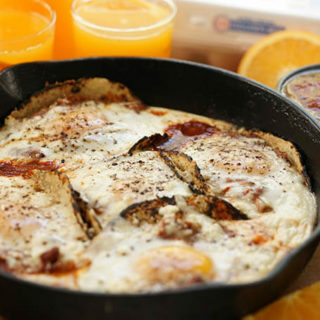 I know you’ll love this meal! 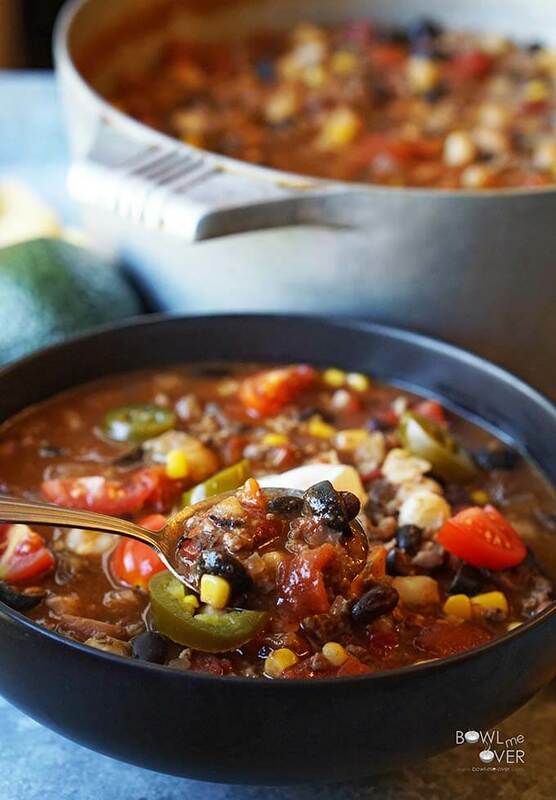 Easy Taco Soup is a spicy and delicious soup that's made with pantry staples! If you can open a can - you can make this fabulous soup - let's get cooking! Brown hamburger meat and drain well. Add the chopped onion and taco seasoning packet. Sauté for a couple of minutes. Open all of the cans - do not drain - and dump everything (juice and all!) in with the taco meat. Increase the heat to high and bring everything to a boil, stir well. Reduce heat to low, stirring occasionally. Simmer for one hour covered. Serve with chopped cilantro, sour cream & tortilla chips. **This is also a great crock pot recipe. If you choose to use the slow cooker, just brown the meat and pour it directly in the slow cooker. 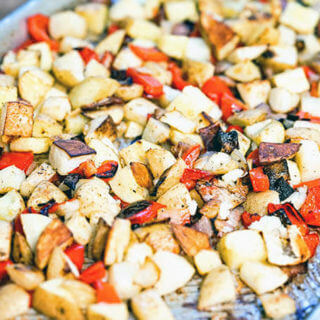 Add all of the remaining ingredients - stir to combine, cover & cook on low for 4 hours. * I like a good amount of spice and use a 4 oz. can of diced jalapeños. To start I'd suggest starting with 2 tablespoons and then adding more jalapeños to top off your soup. 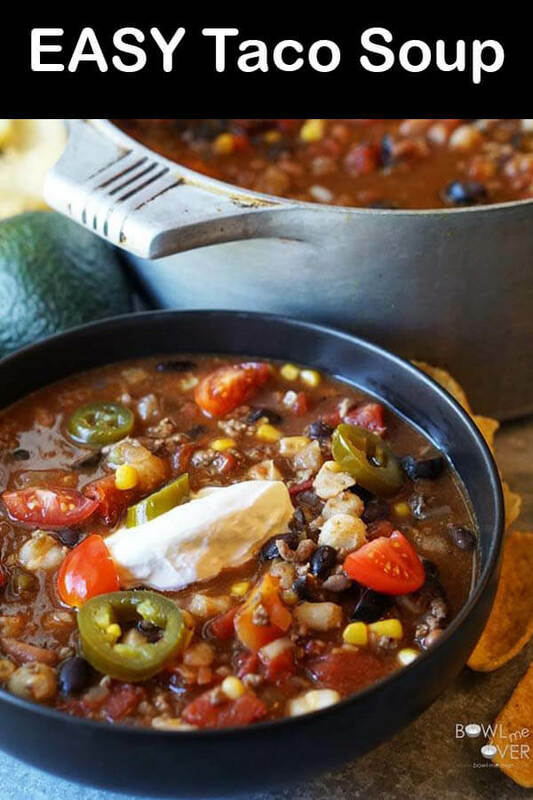 Easy Taco Soup is a spicy and delicious soup that’s made with pantry staples! If you can open a can – you can make this fabulous soup – let’s get cooking! 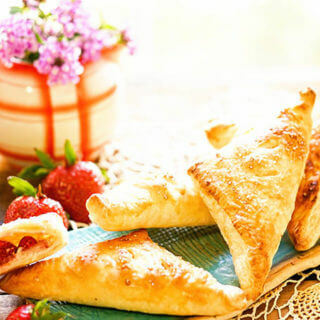 What a full of flavor recipe! I do it as well to my mom’s recipes, I change them so as to fit my taste. Your taco soup looks really easy to make and I can’t wait to try it. Thank you for sharing! Wonderful, thanks Zaria – we’ve enjoyed this soup for many years, I hope you do too! Thanks for stopping by!! This looks so hearty and delicious. I have always wanted to make a taco soup. I think I will try using some homemade sofritos in place of the beef. My son just discovered his love for tacos. This will be an awesome way for me to switch up taco night. I can only eat tacos so many nights – this will be a great way for him to still have the flavors but in a soup! Thanks Christine – I just love this soup, my Mom has made it for years. It’s so good! Awesome – let me know what you think Angela! I know what’s for dinner tonight. Perfect after TOO MUCH TURKEY. My husband loves Mexican flavors! And I’m always nervous about making Mexican because I’m not familiar with this cuisine! But this recipe sounds so doable! I HAVE to make it! Thanks! !